Douglas-fir is near the bottom of the Janka scale. 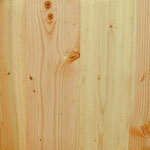 Douglas-fir is typically graded Clear Vertical Grain and #2 Common and Better. Clear Vertical Grain flooring is the highest grade of Douglas-fir. It has vertical grain and a very uniform pink color without knots and defects. #2 Common and Better Fir flooring includes all the character found in the wood. Large knots, light yellow sapwood, and some dark heartwood are found in this grade.